The moment the water reaches its boiling point, alcoholic vapour escapes from the drum and passes through a pipe attached to it. I think that's called distilling. That's not beer, those are spirits. Unless there's a clear and compelling reason for a full ban, a partial anti-commercial ban must be viewed as discriminatory against the Kachasu industry in favour of the bottled industry, and against the poor in favour of the rich (who also have an array of drinking choices). About the same reason why a ban on weed is so popular among official brewers. Many have noted that it is actually sad that the government has allowed a Malawi- made spirit called "Number One" that is just as strong as kachasu being imported into Zambia. The 'Number One' spirit is brewed by local people in Malawi just like Zambian villagers who are being funded by their government in co-operatives, this beer is then brought to Zambia. See Potifer Tembo's piece reference above for on thse missed opportunities. Why is it that the government does not see it as falsifying competition, to benefit foreign producers over Zambian producers? This is not the only issue, but also the so-called economic zones, the benefits given to foreign businesses over Zambian businesses, etc. If they really believe in free competition, let's let all of Zambian owned and operated businesses go untaxed or be minimally taxed. Maybe there should be bottled Kachasu, with people making money from copyrights and people able to choose between official brands. Interesting article by Jared Diamond on the German beer industry. The German beer industry suffers from small-scale production. There are a thousand little beer companies in Germany, shielded from competition with each other because each German brewery virtually has a local monopoly, and shielded from competition with imports. The United States has 67 major beer breweries, producing 23 billion liters of beer per year. All of Germany's breweries produce only half as much. Thus, the average US brewery produces 31 times more beer than the average German brewery. Maybe Zambian producers should be helped to create local monopolies for their product. It might even save a little on foreign currency, because of the lack of importation of other spirits/beers. Ah.. When I was 10 or so years old I watched a documentary on Kachasu. I couldn't remember where in Southern Africa it was from but now I know. And the documentary was scary. For example, it might lead to lost output through causing death or illness, which might even put more pressure on public services (on the flip side, death might reduce long term dependency on the state). Actually death reduces long term dependency for the consumer. But what about the people who depend on that consumer ? Widows, orphans become dependent of the state or the society in general (to an extend). As i have noted above, the UNZA research found that there was no significant contaminants in Kachasu, and crucially no adult has yet died from taking Kachasu directly. 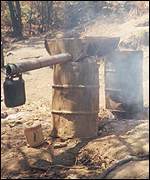 Any health issues appear linked to hygiene and those probably go beyond the Kachasu industry. With alcohol content going up to 70%, I can guarantee you that there are health issues not related to hygene. Things strictly caused by the alcohol itself. So you cannot rest your whole argument on contaminants themselves. The truth of course is that there's no evidence that Kachasu causes poverty. Well, alcoholism (and drug use) and poverty are a vicious circle. But here's my larger point: in the documentary I've seen, which could have been greatly exagerated (you tell me), the Kacahsu drinkers didn't look like beer or wine or palm wine drinkers. The whole thing looked like pictures of Opium consumption in China in the beginning of the 20th century: dozen of men laying on benches knocked out. I mention that because, from that picture, my impression was that comparing it to other spirit, let alone beer (Mr K is totally right) is not accurate. And the social ills may be comparable to Opium or other harder drugs. actually, the informalisation itself is an issue. Standardizing the alcohol content would help consumers to evaluate their consumption. (simply tasting it is unreliable). And excessive alcohol content (beyond 40% or so) and could be banned and the health/social risks limited. Destoy the roads, get rid of the automobiles, get rid of the nation-state, make chieftancies ban "imports" from other chieftancies, keep it going for three or four centuries and you'll have the same virtual local monopolies. As I said the strength depends on the drinker :) If you had fruits it becomes a beer! lol! D-Squared says the same thing. I think the point I was trying to make is that it need not be 70%. "actually, the informalisation itself is an issue. Standardizing the alcohol content would help consumers to evaluate their consumption. (simply tasting it is unreliable). And excessive alcohol content (beyond 40% or so) and could be banned and the health/social risks limited." Thats the key. I am not proposing that the poor be allowed to drink in the current form..just that we recognise that an economic activity exists here that if we properly regulated it and taxed we could avoid other problems. so for now..the Kachasu movement remains on the blog! yeah I read that (he's been on my blogroll for a year). I am not proposing that the poor be allowed to drink in the current form..just that we recognise that an economic activity exists here that if we properly regulated it and taxed we could avoid other problems. Well, yeah. Just be careful to not push the "tradition" and "local entreprise" sides of the argument too far because those can be used to argue against proper regulation and taxation. No "tradition"....I am still working on that traditional article..will blog it soon..
Just to come back to the issue, but 70% is in the Absinth range - check out the Nine Inch Nails video "The Perfect Drug" to get an impression. Absinth is often poured over a sugarcube, to mitigate the bitter taste. It is 70% wood alcohol. Anyway, Zambia and Africa have their own strains of weed (see Zambian Copper), which are worldfamous (especially Malawi Gold and Durban Poison). Weed of course has no calories and you have very little or no hangover. And weed when grown as a fiber crop can be made into literally thousands of products and has many uses, including rehabilitation of eroded soils and farmland. Southern Province could have huge areas of weed, which would give rise to paper, cardboard and textile industries. It could produce biodegradable packaging for the world. Does everyone know that there is a huge area in the Pacific Ocean, that is practically a raft of floating plastic bags, cups, etc? The area is described as 'twice the size of Texas', which would be slightly over 530,000 square miles. There must be funds available as we speak to deliver green alternatives to plastic - the most obvious being hemp. Legalize it, and create jobs. Great article! I'm surprised you didn't mention prohibition in America. 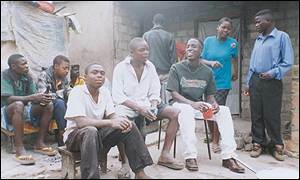 Illegalising alcohol creates an underground market for it controlled by gangsters and mobs, where the liquor is brewed cheaply and irresponsibly by gangsters wishing to make a quick buck. By legalising it you create anther government source of revenue (good on the Malawi government). Under prohibition people still drunk alcohol only in dark bars and seedy settings controlled by mobs, you legalise it and it’s drunk in an open settings where drinkers are more responsible and controlled in there drink habits. I had not looked into American experiences! Indeed, the benefits of formalisation actually go beyond the development of the sector. There are other benefits, such as reducing on the costs of policing an unnecessary underground sector, etc. The American prohibition was a ban on ALL ALCOHOL consumption. To an extend, when one bans one type of alcohol, consumers can reallocate their consumption elsewhere. And also, Zambia already has some of the effects. Cheap brewing and maximalization of alcohol content. I suspect with 100% prohibition the impacts are more severe...not to mention policing costs..
Alcohol prohibition created the mafia, while prohibition of marijuana and especially cocaine created the kartels. Columbia has been practically taken over by individuals who are waging a permanent war from profits from the cocaine trade. Either the various kartels, or the leftwing FARC guerillas. Even the CIA got in on the action, as witnessed by the Iran-Contra affair. That too is the consequence of prohibition. Government prohibition created a whole illegal market. Isn't your proposal of banning only one type of alcohol going to drive people toward drinking official, imported spirits instead? Why not have a legal, Zambian kachasu industry instead? And why have prohibition, instead of legalisation? Well, if the kachasu industry manages to standardize and to get more expensive (that's an important point, people's budget are limited and the cheapest a product is, the more they'll consume and high consumption has health effetcs), I don't see why a prohibition would be necessary. And if it is, I'm not sure it had to go to imported spirits. First of all, people don't necessarily reallocate spirit for spirit and second, I don't see what stop Zambians from producing less dangerous spirits. I am surprised though that the status quo has remained. I have received various emails on this and everyone agrees that a regulated Kachasu industry is the way forward. Kachasu is very popular in NW province where it is called Lituku or Chavuma water and is drunk responsibly. The formula used in the urban areas has been modified to make it more potent. Things like yeast are added during the fermentation process which results in more alcohol per volume. I witnessed a simple test where a piece of beef liver sizzled when immersed in Kachasu. In my opinion the danger of Kachasu emanates from the fact that it is cheap, very potent and if taken in large quantities or over a long period of time it lead to Cirrhosis of the Liver and other complications. Furthermore, people tend to consume the drink on ‘empty stomachs’ which does not help matters. Anyone who has witnessed Kachusu being brewed (as I have done) would know that the hygiene issue is just a smokescreen. The stuff is produced by distillation which is inherently a clean process. In my opinion the process is more hygienic than making munkoyo, 7 days (Gakanta - Tonga brew) or Katubi. I think the Kachasu issue has become ignored simply due to poor understanding of issues by our policy makers. Articles in the media don't help either!